Note : As we confirm speakers the time, day, or descriptions of some events may change. Meet in the Hilton Chicago lobby at 2:00 p.m., tour begins at 2:30 p.m. 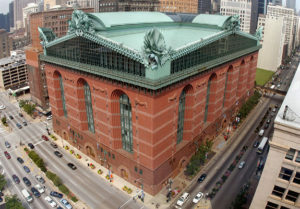 The tour will begin with highlights of building features and library services and end with an introduction to the Chicago Public Library’s Special Collections holdings on the history of Chicago and development of the Chicago Public Library. Get to know your colleagues better, connect with new members and long-time friends, discover common ground and sources of support from within the APLIC network. Research impact is a continuing buzz word in the scholarly ecosystem. With all this attention, we are prone to rush into an impact assessment without taking a step back to understand the objectives of evaluating research. This presentation will cover the objectives of evaluating research, the nuts and bolts of an evaluation model, and show interesting examples of research evaluation in action. As the number of knowledge organization systems (KOS) continues to proliferate, and the tendency of library catalogs and databases to include more than one of them increases, the integration and interoperability of these multiple KOS continues to be a challenge. There are several techniques that can be used to address this problem, one of which is to map equivalent terms in two or more of the KOS. This is the project that Northwestern University began in 1990 with the mapping of the Medical Subject Headings System and the Library of Congress Subject Headings System (and vice versa). The project has continued up to the present. This presentation will describe briefly the project, some of the issues that we had to solve, and the process of keeping the mapping data current. We invite any and all conference attendees to share something they’ve worked on—a tool, a process, a paper, a study, a resource, a grant, a collection, a search strategy, an outreach activity, anything!—that they’re particularly proud of, that was particularly effective, or even that failed spectacularly! Did you learn from the experience? What would you do differently next time? What went really well? Share sessions should take anywhere from one to ten minutes, and will be informal and voluntary. Celebrate 50 years of APLIC with desserts and drinks!